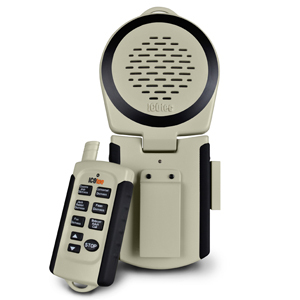 The NEW GC101 is compact, durable and extremely effective for such an affordable unit. You can’t go wrong with this predator call if you are a beginner or a more experienced hunter that prefers a more convenient option. Stretch your hunting budget without sacrificing features or quality! ICOtec is dedicated to developing and manufacturing quality, affordable technology products for the hunting and outdoor markets. All prey calls are licensed from Wildlife Technologies, a world leader in bioacoustics. • 100 yard remote control range. • Plays up to 2 call sounds simultaneously. • 6 quality prey sounds by Wildlife Technologies. • Volume control on the remote. • 100 dB, 5 Watt speaker. A powerhouse for its size! • Rugged construction for durability. • Never misplace the remote with our remote holder.